Gorgeous - in Old Town - Near the Slopes and Main Street! The location of this beautiful Park City condo can't be beat! Situated on Park City's Free Shuttle Route, and within walking distance to Park City Mountain's Resort Center, getting to all of Park City's main attractions is effortless. No car is necessary while lodging in this luxurious vacation rental. However, should the family bring a car, hassle-free parking is made available with a common-area garage providing a heated parking space for one car. Fully remodeled with gorgeous finishings, and fixtures, Park Place 1378 offers a beautiful mountain appeal with a modern twist. Plush and luxurious furnishings also ensure that the condo is as inviting and comfortable as it is aesthetically pleasing. Each of the three bedrooms features a pillow-top mattress, down comforters, a flat screen television and dvd player, and views of Park City Mountain Resort, and The Old Miner's Hospital. The bathrooms are a retreat in themselves. Slate tiling, a jetted tub, raised vessel sinks, custom cabinetry, and granite counter tops, are just some of the incredible features adding to these bathrooms' spa-like appeal. The living room is the perfect place to relax and unwind after a day of snow, sun and fun. There is a gas fireplace featured in the living-room, that is perfect for unwinding with a hot cup of cocoa. In addition, the large flat-screen TV with DVD player ensure effortless entertainment after a long day of Park City exploration. For the cooks in the family, the gourmet kitchen in this condo begs for your culinary expertise. The new stainless steel appliances, custom cabinetry, and granite counter tops ensure a beautiful and functional surrounding that every chef desires. Hardwood flooring throughout the unit adds to the condo's mountain appeal. Gaze at the beauty that surrounds you from the deck while you eat breakfast, sip coffee or as you BBQ with friends and family. The slopes of Park City Mountain Resort are right outside your window. The complex has a shared hot tub which holds 12 people and is perfect for giving sore muscles a little TLC after a rigorous day of activity. Parking is underground and private with a reserved space that has direct access to your unit. There is also a large closet with a secure lock ski/snowboard rack, and a long bench for putting on or taking off your gear. We had everything we needed for our stay in Park City. Rachel was very accommodating to us as well when we asked for a last minute late checkout - much appreciated! The place is beautiful and plenty of space - super comfortable and close to it all! We would definitely stay here again! Stayed here during our first trip to Park City. Previously owned a place in Breckenridge, CO and I could not be more impressed with this place! The unit is well-furnished and comfortably fit my wife and I, our twin daughters, and our parents. The hot tub was used every day and it was wonderful! The sauna was an added plus! I also appreciated how accommodating Rachel was and some of the other units nearby (many of which are full-time residents). They gave us recommendations of places to eat, things to see, and how to navigate rentals for a new location we've never been to before. As far as location, it was one of the best options in the town. It's walkable to the mountain lifts- and it's literally a 1 min drive if you want to park in the lot at the hill. You're also only a few blocks from downtown Park City. Literally everything we needed for the stay was within 4-5 minutes and the underground parking was really nice as well. Would stay here again in a heartbeat and can't say enough great things about the experience! My family of 6 stayed here over Christmas break. Condo very comfortable. Hot tub awesome after skiing/snowboarding. Kitchen with basics made cooking in easy if desired. Everything you need within walking distance. Owner very friendly and helpful. Would highly recommend! Our family of 5 stayed at Park Place 4 for 4 nights recently. We couldn't have been more pleased! The condo layout provided lots of space to hang as a family while also providing plenty of privacy when needed. The place was decorated very nicely with lots of attention to detail and had everything in the kitchen you could possibly need to prepare meals. There's a dry sauna downstairs and a large jacuzzi right outside the kitchen door which was wonderful...very hot, which we all loved. The unit was accessible from the garage which was perfect for getting our bags up and providing a place to leave skis and boots at the end of the day. The bus stops right out the front door, which takes you to the ski mountain as well as into town, but we walked as often as we took the bus because the location is close to both. Rachel was quick with communications, and very generously allowed us early access to the garage, which helped tremendously. I highly recommend this place. We will be back . 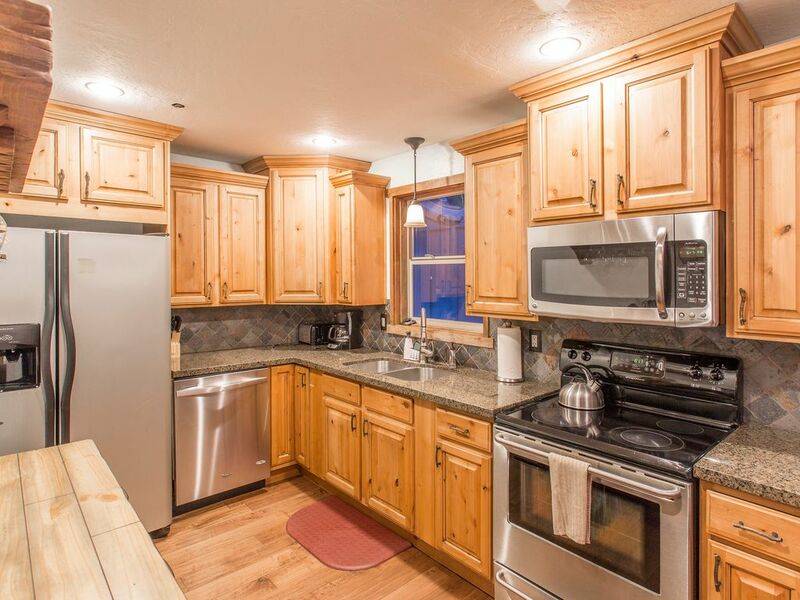 Fantastic rental in the heart of Park City. Can walk to lifts and town without any issue. Also conveniently located for day trips to Snowbird and Snowbasin. Would definitely recommend to others headed to Park City on vacation. Perfect location for Sundance - right across the street from the Library theatre and right on the city bus and Sundance bus routes. The house is cozy with a great communal hot tub right outside the kitchen door. The apartment is also within walking distance to the FreshMarket supermarket. The only negative would be the weak WiFi. Located directly across the street from the City Park which offers a playground and skatepark for the kids. Also, football/softball fields and volleyball/tennis/basketball courts during the non-winter months.